The former army captain also said he would be open to putting a U.S. base in his country, but military leaders quickly squashed the idea. And the day after the nascent administration announced plans to abolish a land-reform program, officials said it would actually remain intact. The far-right leader’s first two weeks on the job have been filled with missteps and communication gaffes and little of his promised sweeping changes — underscoring a steep learning curve for a president elected on promises to overhaul much of daily life in Latin America’s largest nation. Bolsonaro ran on a platform that mixed pro-gun, anti-corruption and market-friendly ideas. Despite having two months after his October election to prepare for his Jan. 1 debut the administration has not hit the ground running. The lack of a cohesive plan is raising questions about Bolsonaro’s commitment and ability to deliver on promises ranging from a major overhaul of the pension system to moving Brazil’s embassy in Israel from Tel Aviv to Jerusalem. Joao Felisbino, a 64-year-old doorman, counters that Bolsonaro just needs more time. “Brazil has been a mess for years. You can’t solve all the problems in a month,” he said, adding that Bolsonaro should not be judged until he has been in office a year. Bolsonaro did issue several executive orders on Day One, including a plan to cease awarding any new land to indigenous groups, a campaign promise. But in the days that followed little happened, and Bolsonaro shifted back to attacking the media and his adversaries. “There is no end to the media lies that come 24 hours a day,” Bolsonaro declared on Twitter. On Tuesday, two weeks after being inaugurated, Bolsonaro issued a decree loosening gun laws, fulfilling a signature campaign promise. As expected, opponents of the measure criticized Bolsonaro for changing the law to allow almost anybody over 25 years old without a criminal record to be able to get a gun. But even many hard-core supporters joined in the criticism, angry that the measure didn’t go far enough. Stocks of gun manufacturer Taurus, which had steadily gone up in recent months on expectations of major changes, fell 22 percent. 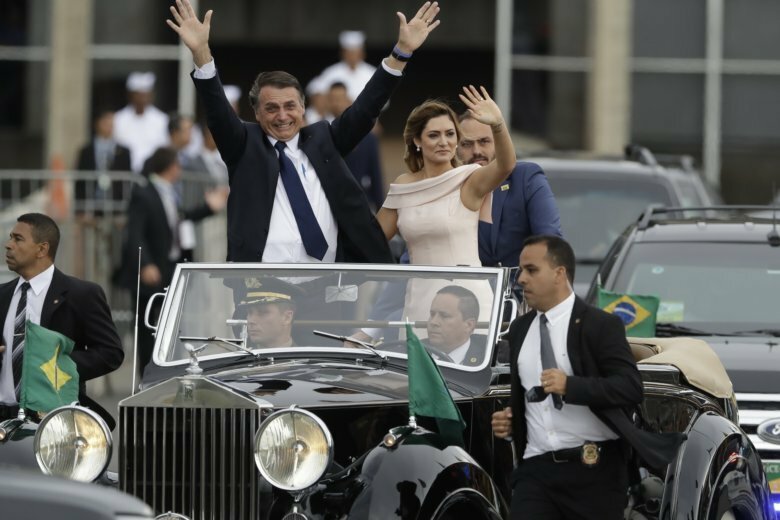 Still, there are more questions than answers about many of his signature pledges, and Bolsonaro is clearly getting a crash course in the magnification of gaffes that come from high office. That happened on his third day on the job, during a military event in the capital, Brasilia. Bolsonaro told journalists he had signed a decree to raise a tax on many common banking transactions like bank transfers, buying foreign currency and debit card purchases online. The move quickly brought a public outcry that it broke a campaign promise of no new taxes. Hours later, the head of Brazil’s tax agency said the president was wrong, as did Bolsonaro’s chief of staff. Paulo Guedes, the economy minister, was reportedly infuriated, though he did not comment publicly. In the end, there was no new tax. Another flip-flop came Jan. 8, when the administration said it was freezing a land redistribution program that gave under-utilized state and private land to the poor. The next day, however, it was announced that the program would continue. After the bank transfer gaffe, Bolsonaro has mostly avoided economic issues since being inaugurated. During the campaign, he often said he didn’t understand the economy and instead deferred to Guedes, a University of Chicago graduate who has advocated steep budget cuts and widespread privatizations. Bolsonaro’s wavering on promised pension reforms has also raised concerns. Four days after taking office, the president, who spent 28 years in Congress, spoke in favor of a minor reform he said had a chance of being passed. It would establish the minimum retirement age at 57 for women and 62 for men. A more comprehensive bill considered by Congress last year set the minimum age at 62 for women and 65 for men. Meanwhile, military leaders say the armed forces should be excluded from any pension reforms, which could bring more clashes between the president and his team. Bolsonaro’s administration appears to be paralyzed on a promise to move Brazil’s embassy in Israel from Tel Aviv to Jerusalem, a move that thrilled evangelical voters, a key constituency of his election victory. Even before the inauguration, administration officials appeared to be curbing enthusiasm for the idea, which could have widespread impact on Brazil’s meat exports to Muslim countries. Not surprisingly, the far-right leader’s stumbles have emboldened Brazil’s opposition. “If this continues, Bolsonaro’s popularity will last six months,” said defeated candidate Ciro Gomes, who finished third. Leandro Colon, Brasilia editor of Folha de S. Paulo, said in a column that technical and bureaucratic reasons were at the heart of the slow start, which did not necessarily represent a bad omen for the far-right leader’s administration. “But the president needs to understand quickly what the chair he sits on actually means,” Colon wrote.